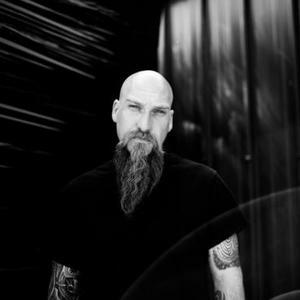 Steve Von Till is best known as singer and guitarist for the atmospheric metal band Neurosis, replacing Chad Salter in 1989. He is also in Tribes Of Neurot and Culper Ring, and records solo work under both his given name and the moniker Harvestman. His solo albums comprise of original songs and traditional folk arrangements, using minimalistic acoustic guitar and vocal styles. Outside his semi-professional role as a musician, he works as an elementary school teacher. His father, Steven Von Till, Sr, is a civil attorney in the San Francisco Bay Area, United States. Outside his semi-professional role as a musician, he works as an elementary school teacher. His father, Steven Von Till, Sr, is a civil attorney in the San Francisco Bay Area, United States. Perhaps the history of the song is innate within us. At least that's what we might glean from Steve Von Till's third Neurot Recordings solo outing A Grave is a Grim Horse. Intertwined with interpretations of songs by Nick Drake, Townes Van Zandt, Mickey Newberry and Lyle Lovett, Von Till's powerful yet subtly graceful originals merge with a lexicon that manifests as something beyond signature, something beyond the concept of persona that popular culture has repeatedly sold us over the past 50 years. Where his previous releases showed reverence for folk music forms of the past, A Grave is a Grim Horse peers directly inward, drawing from this history of song and earnestly embracing the need we all share to etch our mark upon the artifacts that will ultimately survive us. Listening to the album, there's a troubling theme that reveals itself only when we're not seeking it. It tells us that we are nothing more than part of the sum of an elusive whole, but sometimes the patterns that define us can be harnessed, as they are here. And, what's most striking about the album is that Von Till's originals are so immediately captivating and threadbare that they seem more familiar upon first listen than the works of the time-honored songwriters to whom he pays tribute. Songs like the title track and "Looking for Dry Land" show Von Till coming into his own as a composer and arranger, perfectly adorning songs with flourishes of swooping strings, pedal steel, organ, et al. There's a somber restraint throughout, allowing the plaintive melodies to elevate each song beneath Von Till's breathy whisper that's reminiscent of similarly raspy, whiskey-throttled voices of Mark Lanegan and Michael Gira. Steve Von Till is most widely recognized as vocalist and guitarist in Bay Area heavy post-psychedelic punk legends Neurosis. But, the breadth of his talents and interests reaching far beyond that band's thunderous intensity have been well established over the course of related projects like the experimental offshoot Tribes of Neurot, psych-drone band Harvestman and acoustic guitar based solo releases As the Crow Flies (2000) and If I Should Fall to the Field (2002). Von Till's intense obsession with ancestry and many things ancient is deeply ingrained in all his work, but none more than within his solo recordings. His first two albums focused intently upon sounds and stories of ages past, eloquently serving to reconnect with forgotten mythologies and long-buried verse. While the same reverence remains on A Grave is a Grim Horse, it is also Von Till's most personal and confident effort to date. Having traded city life for a rural existence in the open skies, wilderness and dense forests of Northern Idaho, the songwriter's dedication to these transcendent themes seem all the more focused and equally freed from contemporary trappings. Ages ago, folk songs traveled through human history like a plague mutating and adapting the characteristics of each carrier and compounding the ghostly weight of the past. Von Till shows a depth and breadth to his songwriting that makes If I Should Fall to the Field flow like the bloodlines that connect us all. The album opens with the parched weight of the title track, as the singer mournfully strums a bleary twanging guitar line, yearning for a departed elder, singing, "what the dead reveal to the living/ My blanket can't keep out this cold/ A grave is a grim horse to ride." The last line poignantly punctuated by a loud, chiming guitar line drenched in reverb. "Clothes of Sand" is a reinterpretation of a rare Nick Drake song, unreleased in his lifetime, that Von Till makes his own by fitting its claustrophobic candor with a smudged, fatalistic sounding string accompaniment. Elsewhere, "Valley of the Moon" is a deeply impassioned account that seems both a chronicle of the singer's own pilgrimage in anticipation of catastrophes to come as an echo of those who'd previously endured similar hardships. While the song sounds wholly autobiographical, it is inspired by the Jack London book of the same name that eerily parallels Von Till's own exodus from city life. "Looking For Dry Land" is a moving attempt to reconnect to that very humanity that has long since departed. The finality of album closer "Gravity" is incredibly moving. "What's done is done/ What's gone is gone" Von Till sings seemingly simultaneously to bid farewell to a past, a loved one...perhaps even all of us. It's a resignation, just as the title suggests, echoing that of an old Irish limerick of the grim horse that delivers us to whatever may lie beyond this life. And, at the same time, it's an immense release to realize that we've only played a temporary host to this virus of song. A Grave is a Grim Horse is a beautiful vessel to that end.